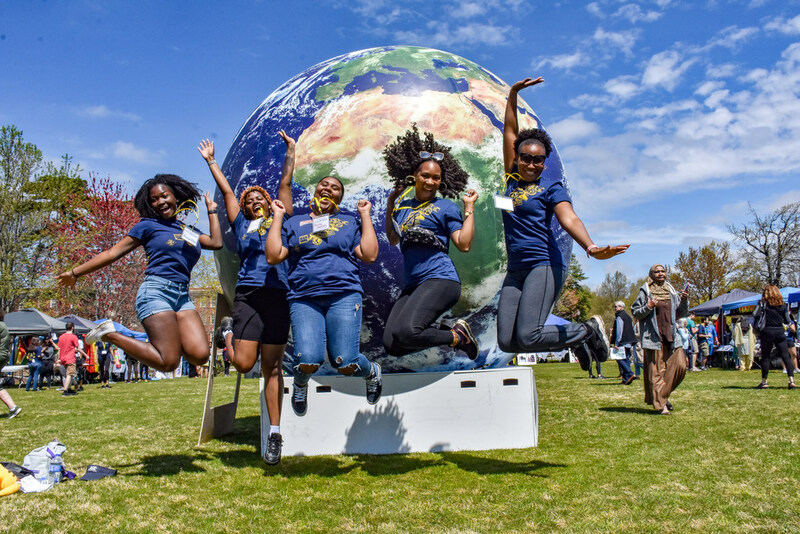 For one week – March 31- April 6 – the UNCG community joined to tell our story in images, and showcase what it’s like to be a Spartan. Thanks to everyone who shared photos! View our published images by day or our #AWeekatheG social media feed. 9:02 p.m. April 6. 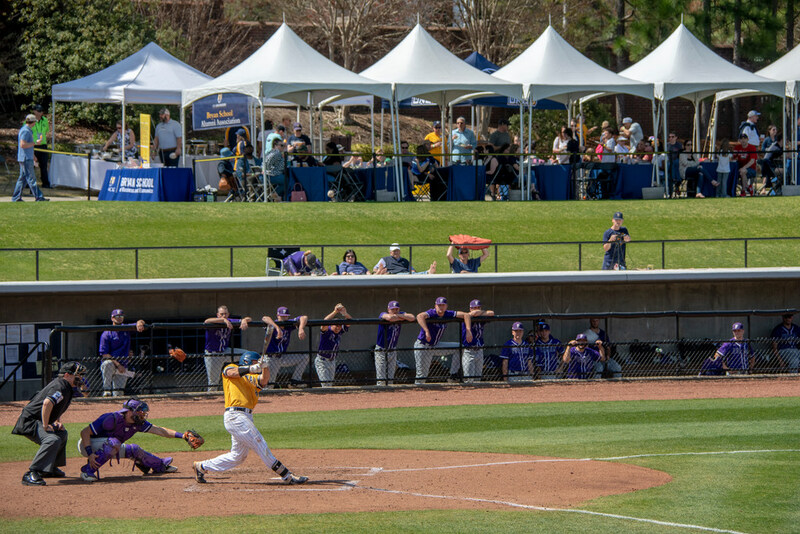 UNCG Baseball Stadium. 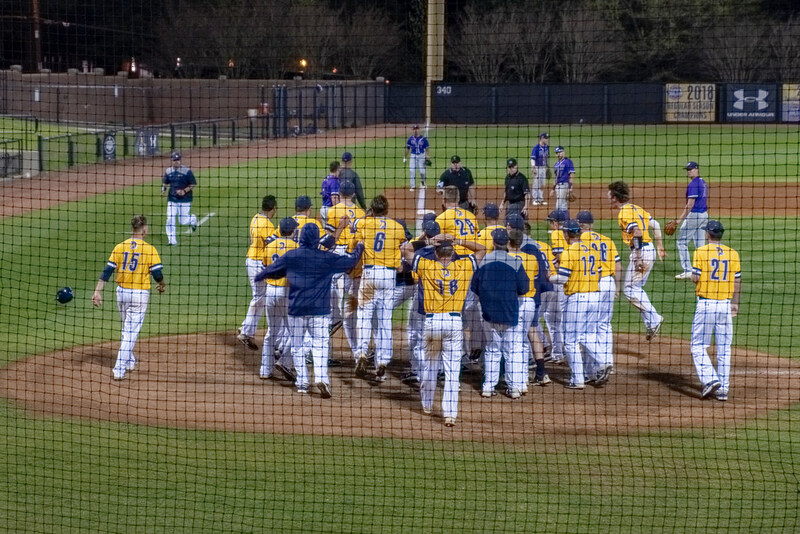 Men’s Baseball celebrates their win against Furman in the bottom of the 13th inning, 11 to 9. Photo: Martin W. Kane. 7:16 p.m. April 6. EUC. 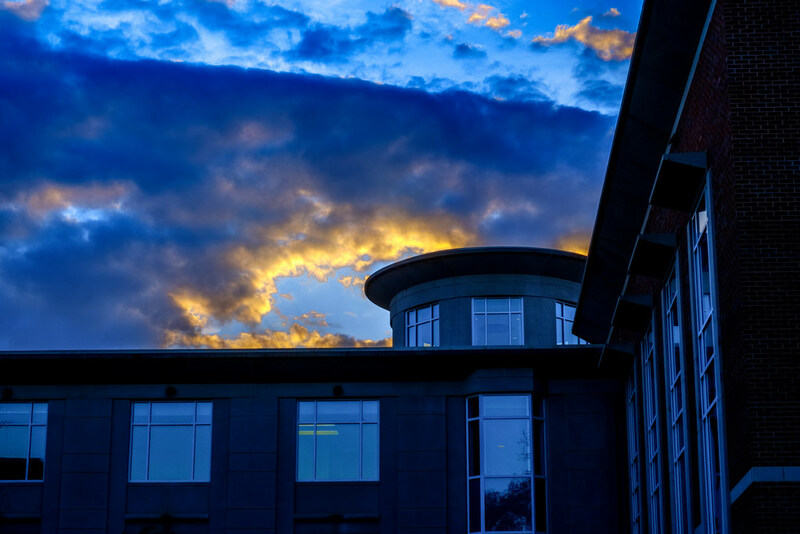 The sun sets over the EUC, bringing the week to a close. Photo: Martin W. Kane. 5:27 p.m. April 6. Music Building. 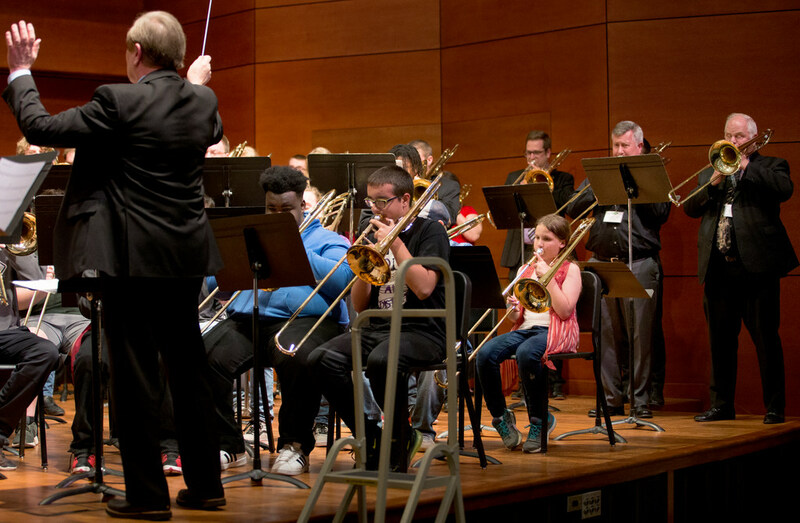 Dr. Randy Kohlenberg from the School of Music directs trombonists of various ages and experience levels in their final performance, “Salvation is Created,” during the 22nd Annual North Carolina Trombone Festival. Photo: Lynn Hey. 3:22 p.m. April 6. Kathleen Clay Edwards Library. 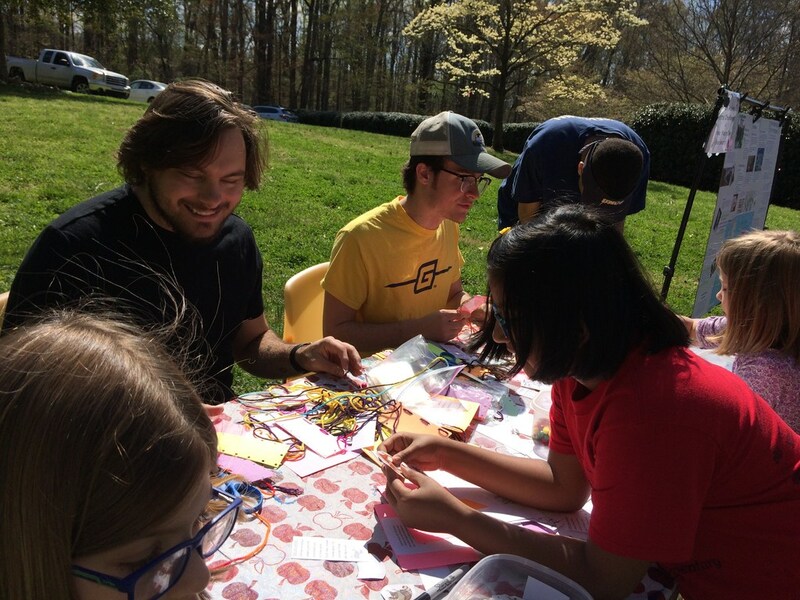 Communication studies students help children make nature bookmarks at the annual Greensboro Earth Day Fair. Photo: Etsuki Kinefuchi. 3:20 p.m. April 6. Music Building. 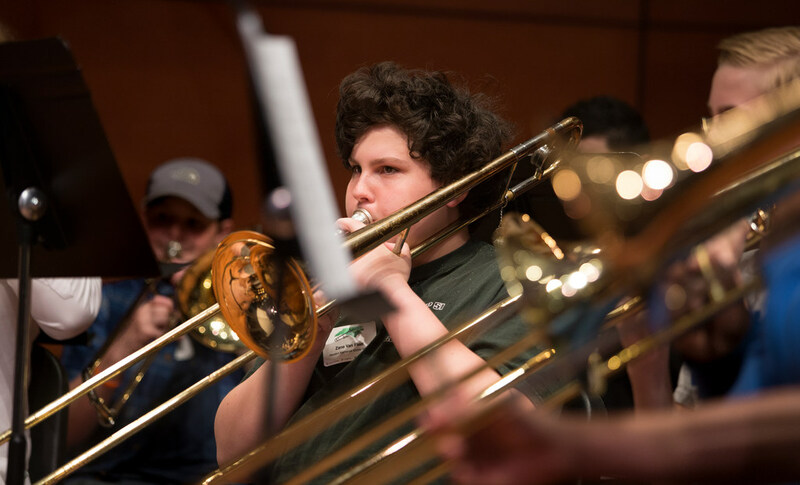 Zane Van Fleet, a Western Alamance Middle School student, practices in the intermediate trombone choir under the direction of Drew Creech, at the 22nd Annual North Carolina Trombone Festival held on campus. Photo: Lynn Hey. 2:56 p.m. April 6. Baseball Field. Campus buzzes with activity on Saturday afternoon. Bryan School alumni and graduate students attend a “Spartan Spot” at the UNCG v. Furman baseball game. Photo: Martin W. Kane. 2:42 p.m. April 6. Baseball Stadium. 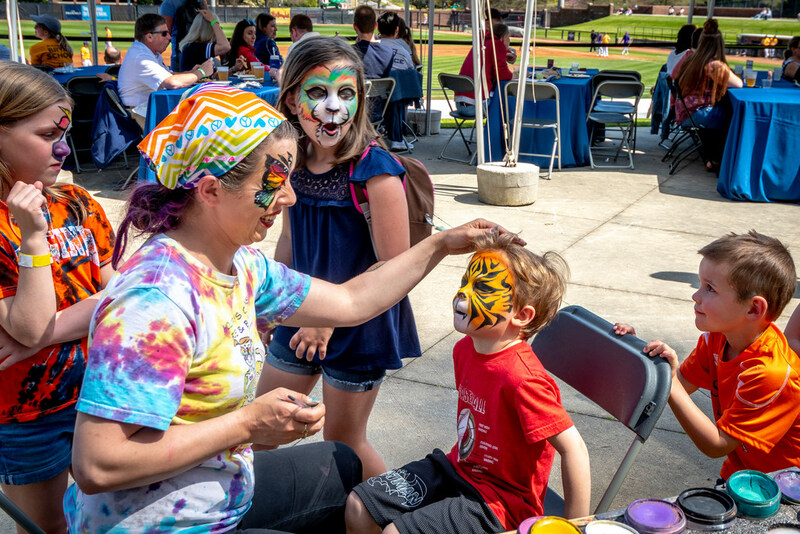 A popular childhood activity – face painting – was included in activities for alumni and graduate students attending Saturday’s baseball game against Furman. 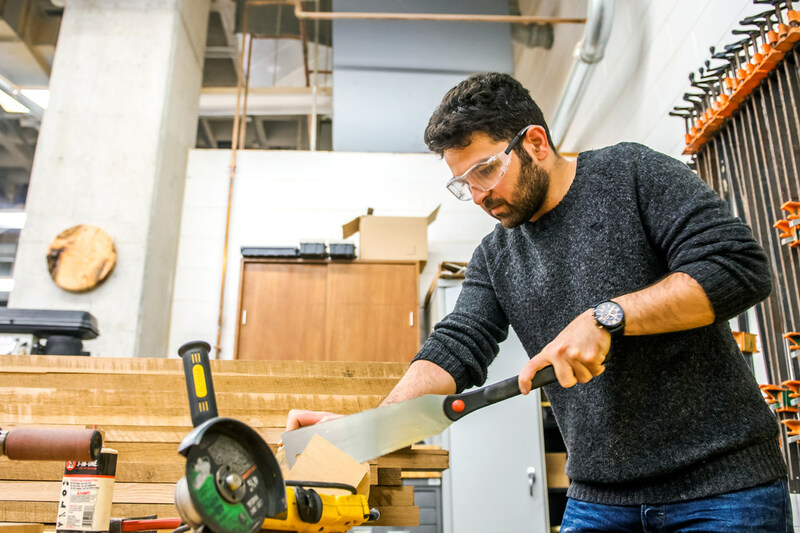 The Bryan School of Business & Economics hosted the “Spartan Spot” to reconnect with graduates of the program. Photo: Martin W. Kane. 2:26 p.m. April 6. Elliott University Center. 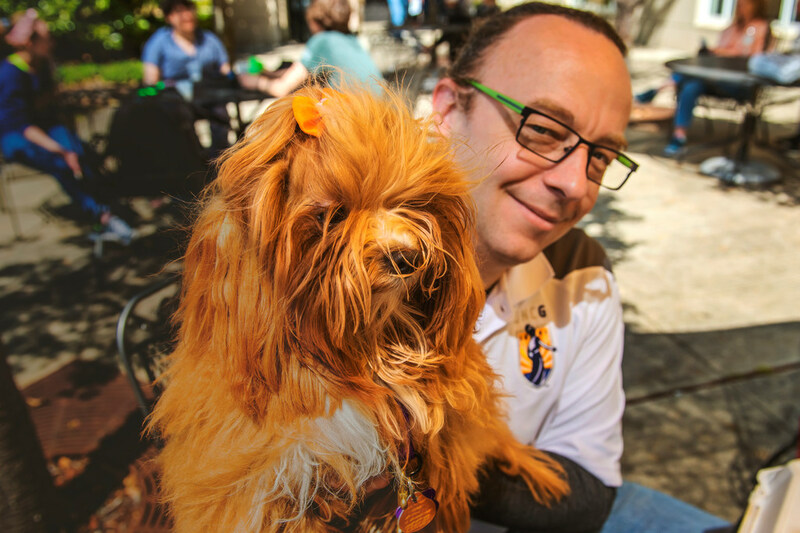 Philosophy Professor Wade Maki and his 9-month-old dog, Ahsoka, take a break outside of the EUC while attending the International Festival. Photo: Jiyoung Park. 2:07 p.m. April 6. Weatherspoon Art Museum. 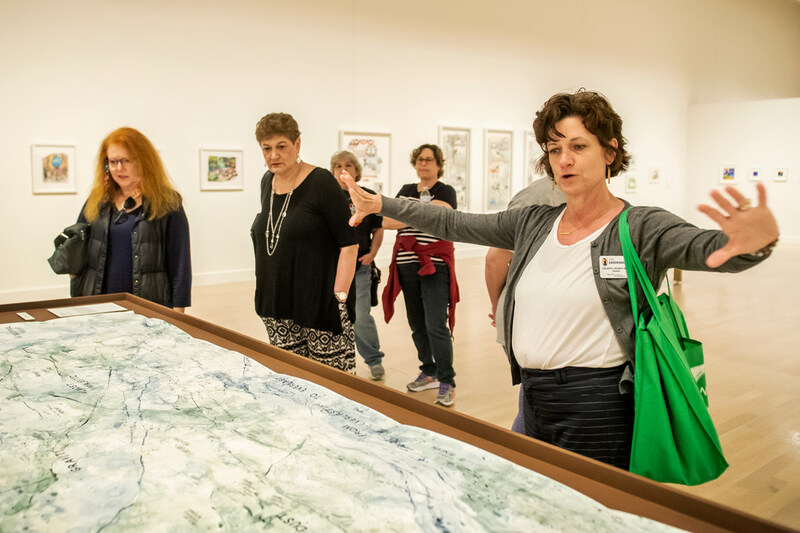 Docent Celeste Chaney-Hill (right) leads a Slow Art Day tour. Audrey Krakovitz (background) brought her friends to the art museum to celebrate her 55th birthday. Krakovitz’s son is a sophomore business student at UNCG. Slow Art Day is a global event that aims to help more people discover the joy of looking at and appreciating art. Photo: Jiyoung Park. 1:13 p.m. April 6. Recreation Field. Men’s Rugby Club members Daniel Verhaagen, left, takes a big drink of water from “Jug Judy,” the team’s communal water jug, as teammates Ray Matteson, center, and Colby Borges look on and laugh following practice. The rugby club, in its 41st year, currently has 12 players from five countries. The squad decided on an impromptu scrimmage to prepare for next weekend’s Southern Rugby Conference Tournament at Elon University. Photo: Lynn Hey. 12:49 p.m. April 6. EUC Lawn. 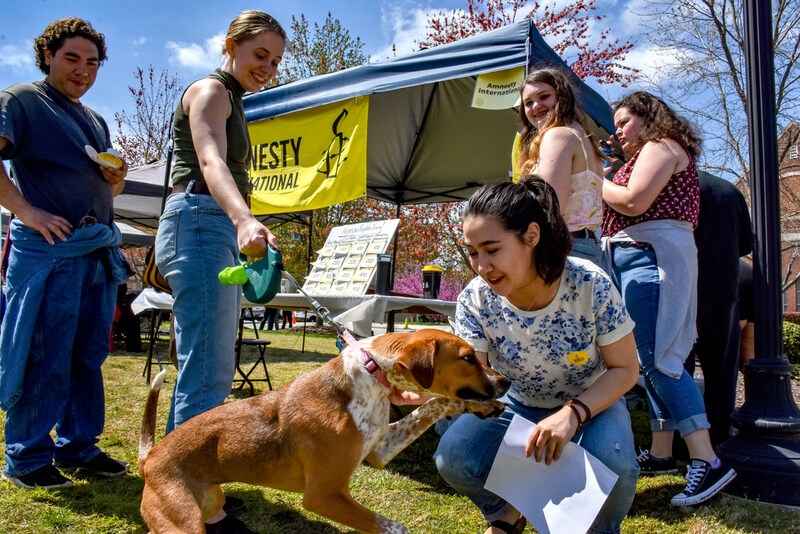 A friendly dog greets students at the Amnesty International booth at UNCG’s International Festival. More than 5,000 people are expected to attend today’s festival. Photo: Alycee Byrd. 12:47 p.m. April 6. EUC Lawn. 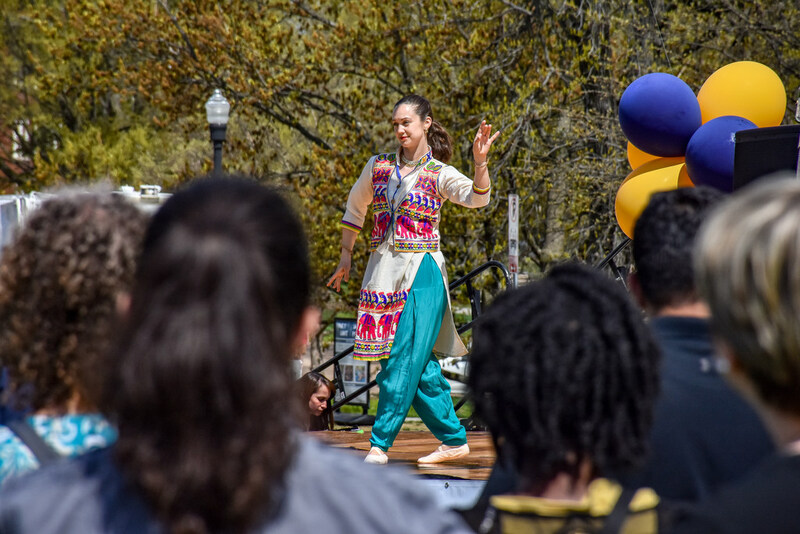 Volunteers at UNCG’s 37th annual International Festival jump in unison. Festival-goers are enjoying a sunny and warm Saturday after rain showers the day before. Photo: Alycee Byrd. 12:46 p.m. April 6. Mary Foust Residence Hall. Members of the band ‘Lyrebird’ perform at Foustock music festival. 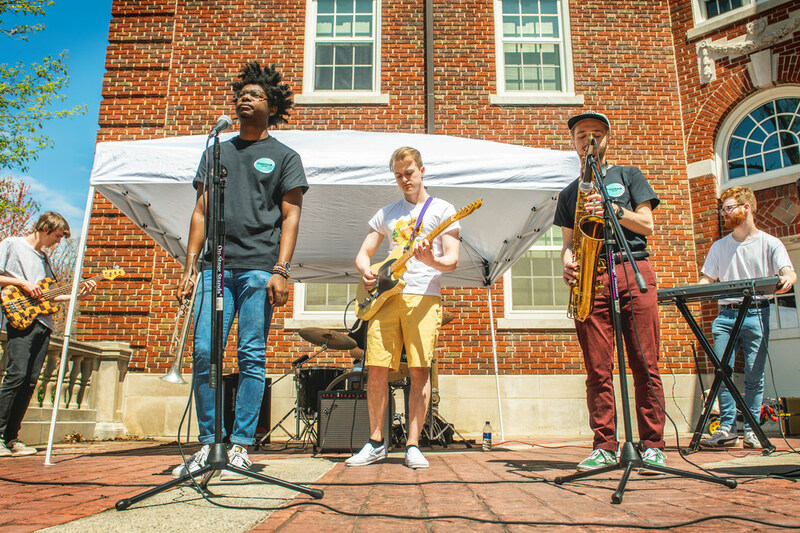 Foustock, inspired by the famous Woodstock music festival, is an annual campus event that Ashby Residential College hosts for start-up bands. Photo: Jiyoung Park. 12:31 p.m. April 6. Recreation Field. Men’s Rugby Club member David McPhail escapes a tackle during practice. The rugby club, in its 41st year, currently has 12 players from five countries. 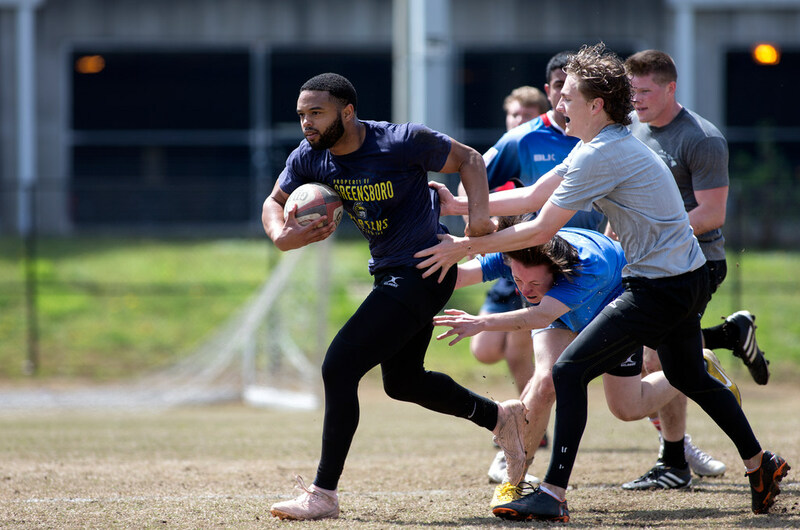 The squad decided on an impromptu scrimmage to prepare for next weekend’s Southern Rugby Conference Tournament at Elon University. Photo: Lynn Hey. 12:06 p.m. April 6. Moore Nursing Building. 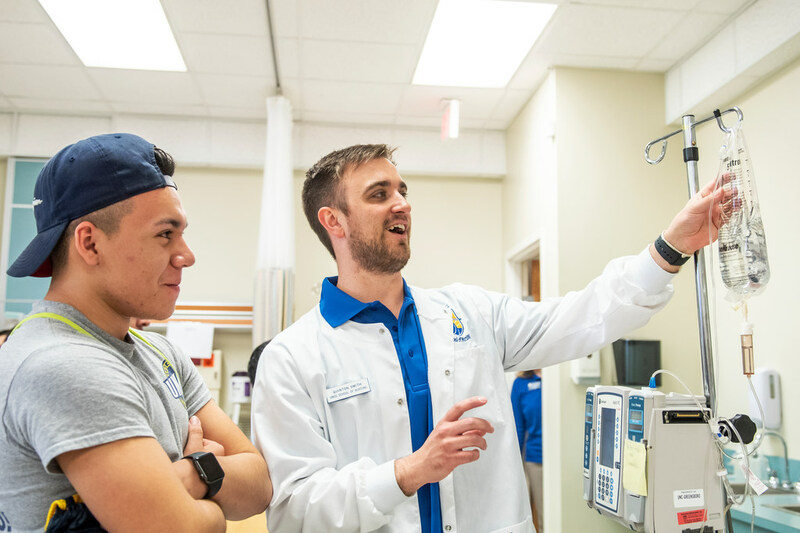 All aspects of UNCG are on display during Destination UNCG, including the nursing simulation lab. Quinton Smith, a junior nursing student (right), demonstrates parts of the lab to a newly admitted Spartan. 11:58 a.m. April 6. Moore Nursing Building. 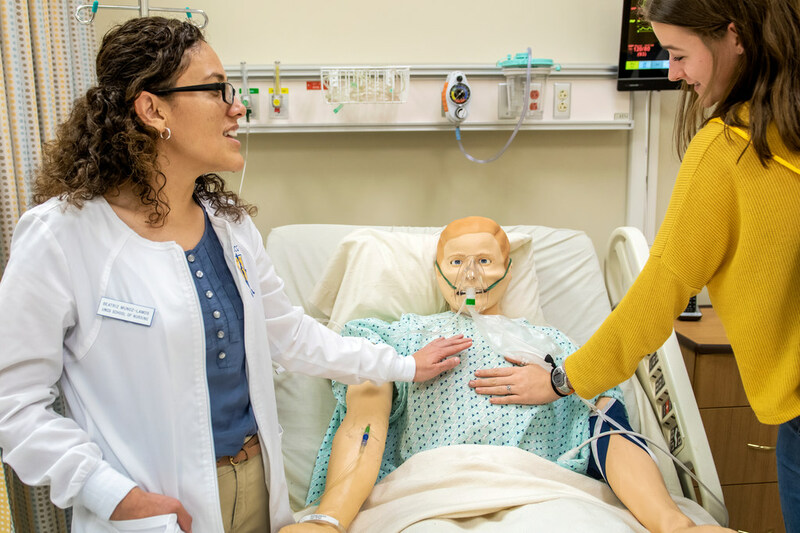 Beatriz Munoz-Lamos, a nursing student (left), participates in a tour of the nursing simulation lab as part of Destination UNCG, a spring event for newly admitted students. Photo: Jiyoung Park. 11:02 a.m. April 6. Coleman Building. Who likes to wake up early? 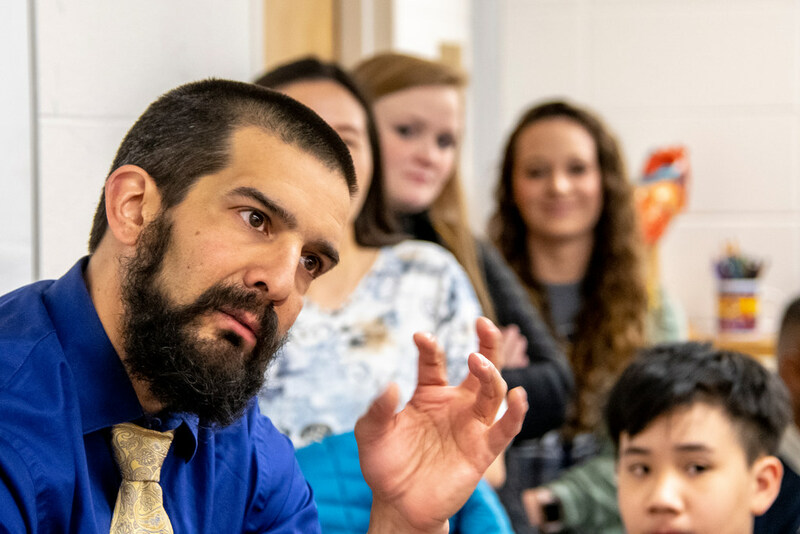 Here, Dr. Aaron Terranova advises newly admitted Kinesiology students how important it is to be there, right on time, for those 8 a.m. classes. He’s humorous in his presentation at Destination UNCG, with an important tip for student success. He is associate professor and director of Undergraduate Studies for Kinesiology. Photo: Martin W. Kane. 10:53 a.m. April 6. Sidewalk on Tate Street. 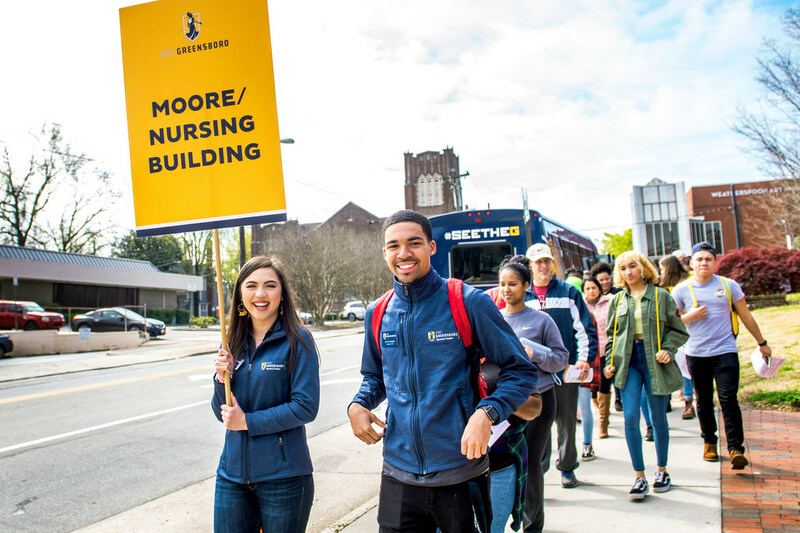 Diana Huynh, a junior nursing major and Spartan Guide, and Dylan Dodson, a sophomore geography student and Spartan Guide, lead the way to Moore Nursing Building from UNCG Auditorium. 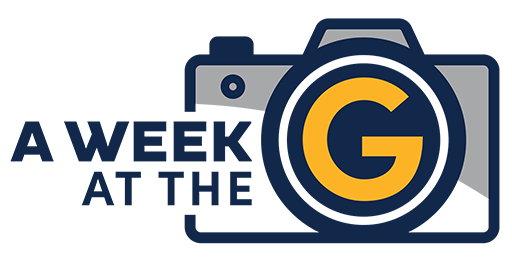 Destination UNCG is an open house event for admitted students and family members. Photo: Jiyoung Park. 10:47 a.m. April 6. Greensboro History Museum. University Libraries Digital Technology Consultant Richard Cox discusses the Well Crafted NC project. 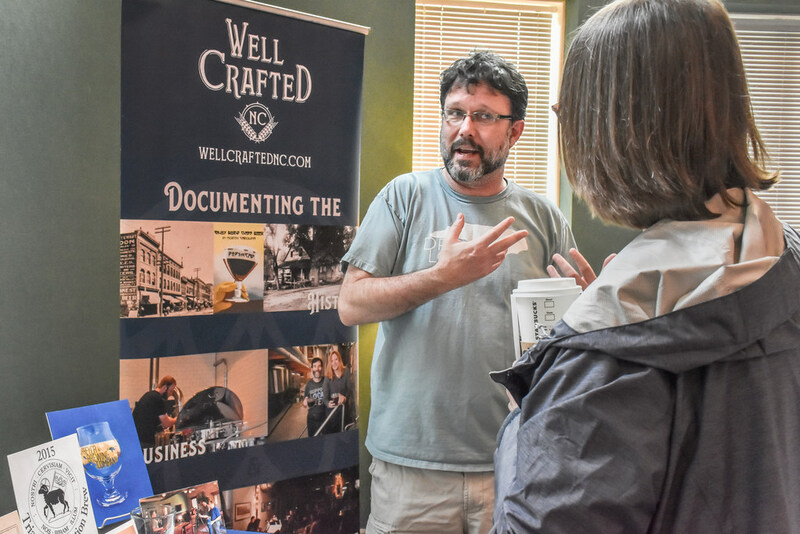 Well Crafted NC, which is a UNCG University Libraries endeavor, promotes North Carolina craft breweries and celebrates North Carolina’s rich history in brewing. Erin Lawrimore, Kathelene McCarty Smith, and Clarie Heckel are among other UNCG Libraries staff members at the Triad History Day public festival at the museum. Photo: Alycee Byrd. 10:46 a.m. April 6. Greensboro History Museum. Dr. Clarie Heckel (right) shares information from the People Not Property Project. The project is a collaborative endeavor among the UNCG University Libraries, the North Carolina Division of Archives and Records, the North Carolina Registers of Deeds, the Afro-American Genealogical Society, web developers, elected officials and others. The project is leading towards creating a digitized records of slave deeds and bills of sale, indexing the names of enslaved people from across North Carolina. 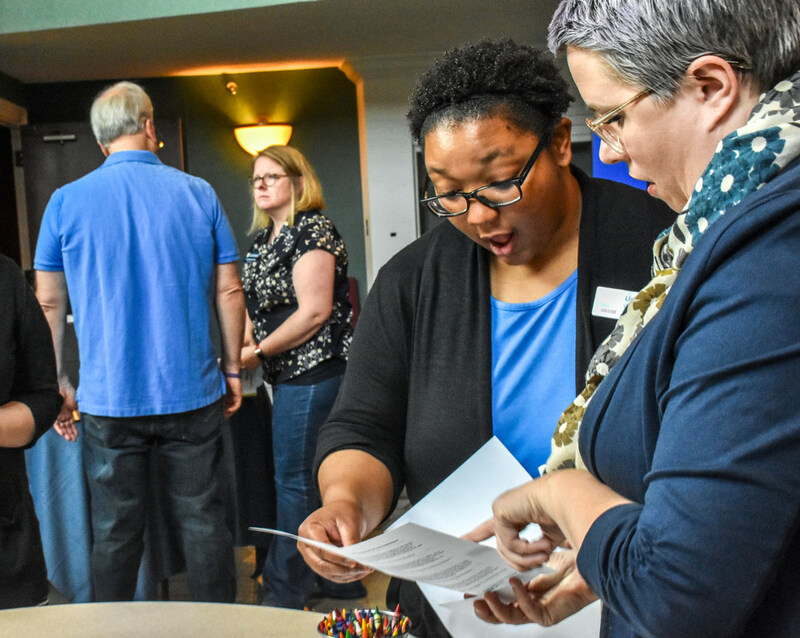 Heckel, an alumna who received her post-baccalaureate certificate in museum studies at UNCG in 2006, joined University Libraries in January as the People Not Property Project coordinator. Photo: Alycee Byrd. 10:38 a.m. April 6. Along Spring Garden Street. 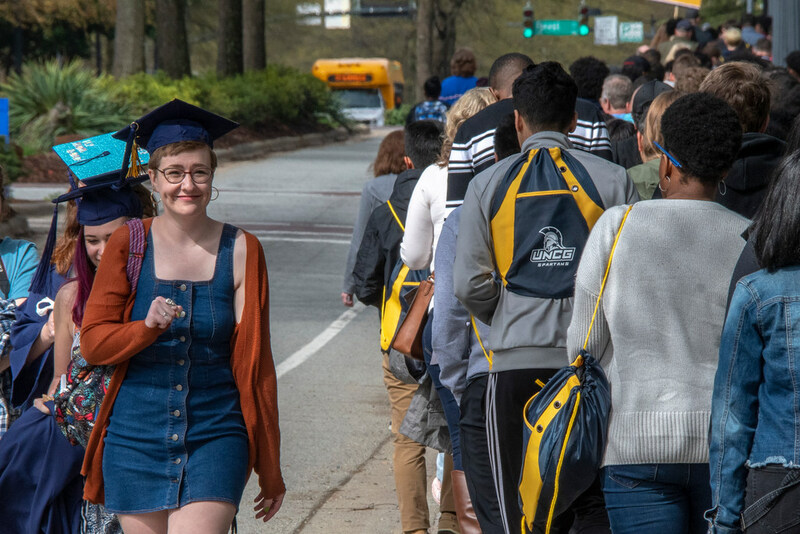 Brigid Meier, graduating in May with a BFA in theater education, passes by newly admitted students during the Destination UNCG open house. Photo: Martin W. Kane. 10:15 a.m. April 6. Horsepower Therapeutic Learning Center. Deanna Spann, Anabelle Charles, Kalonji Jegede-Roberts and Josh Kebreau (l-r), discard old scrap wood. 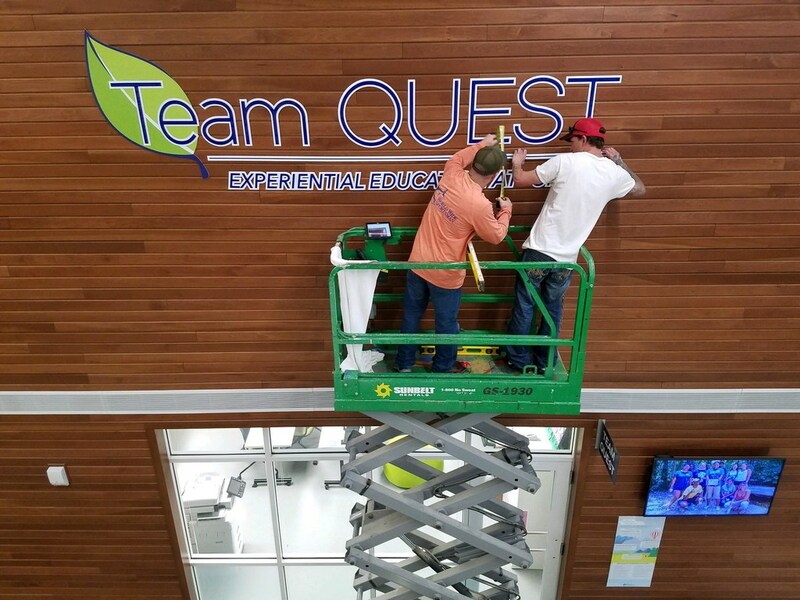 These UNCG students are taking part in a monthly service day event in the Catalyst program. 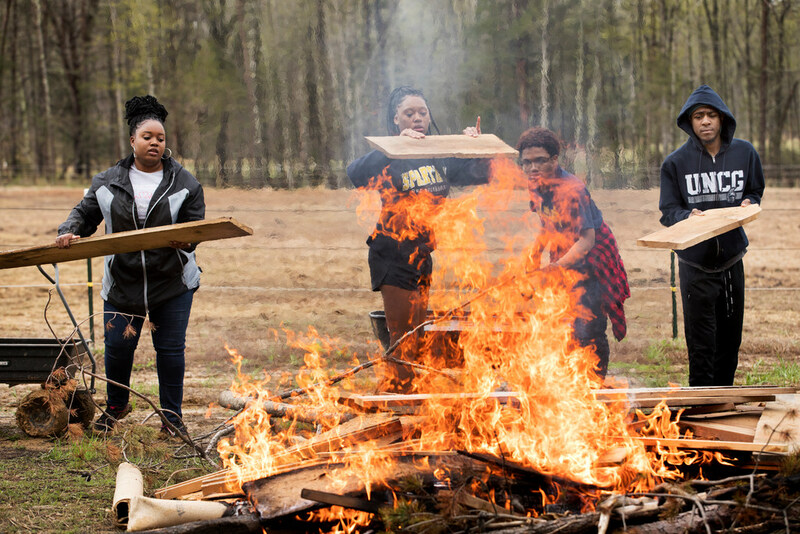 Community engagement, service, and leadership are key parts of UNCG’s Office of Leadership and Civic Engagement programs. The Horsepower center, in a rural part of Guilford County, provides therapeutic horseback riding and equine assisted therapy to over hundreds of individuals with disabilities each year. 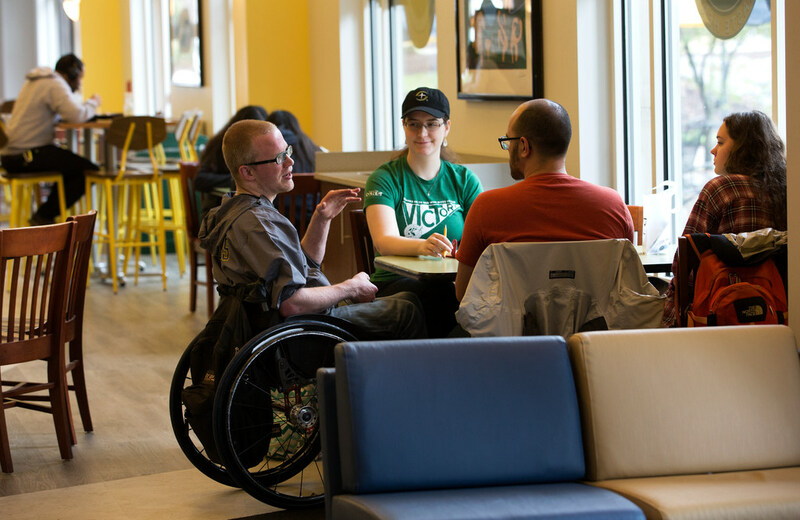 The theme for this Catalyst day is “Including People with Intellectual and Developmental Disabilities.” Photo: Lynn Hey. 9:25 a.m. April 6. UNCG Auditorium. 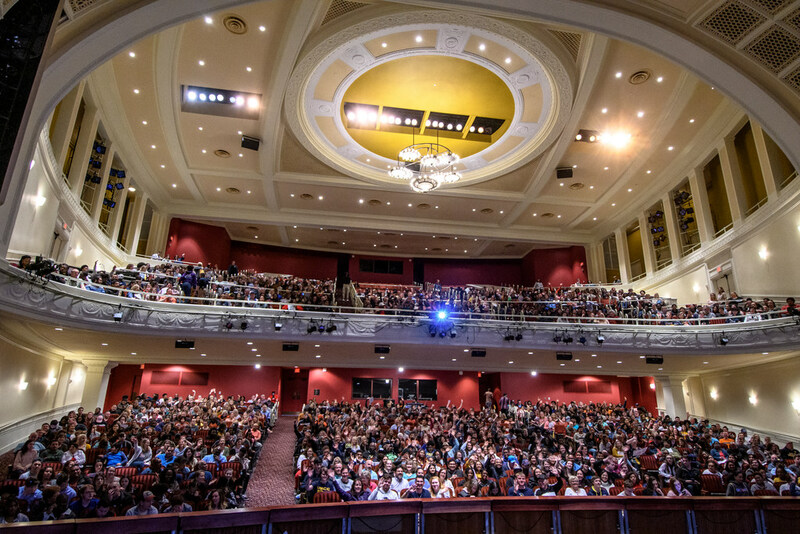 Destination UNCG, an open house event for admitted students and family members, begins in beautiful UNCG Auditorium. It’s a full house. 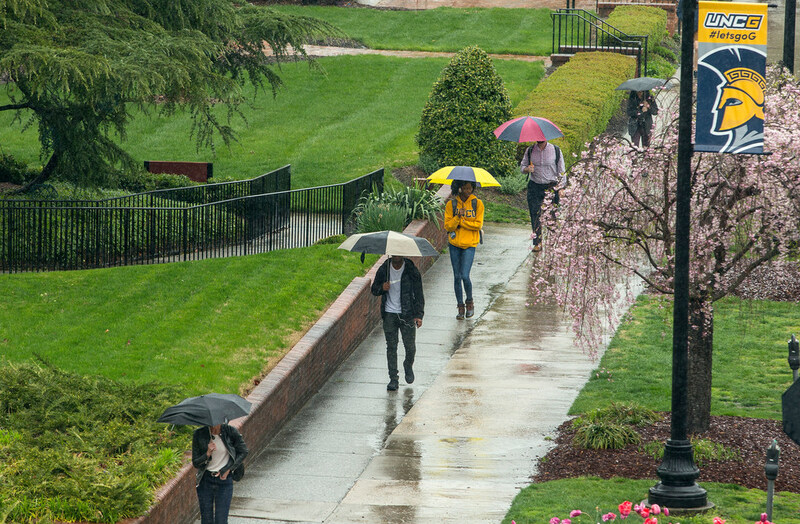 After an introduction from the Director and Senior Associate Director of the Undergraduate Admissions Office, the day follows a schedule of activities and information sessions held in different academic buildings, the EUC, and other locations on campus. Photo: Martin W. Kane. 8:56 a.m. April 6. In front of UNCG Auditorium. 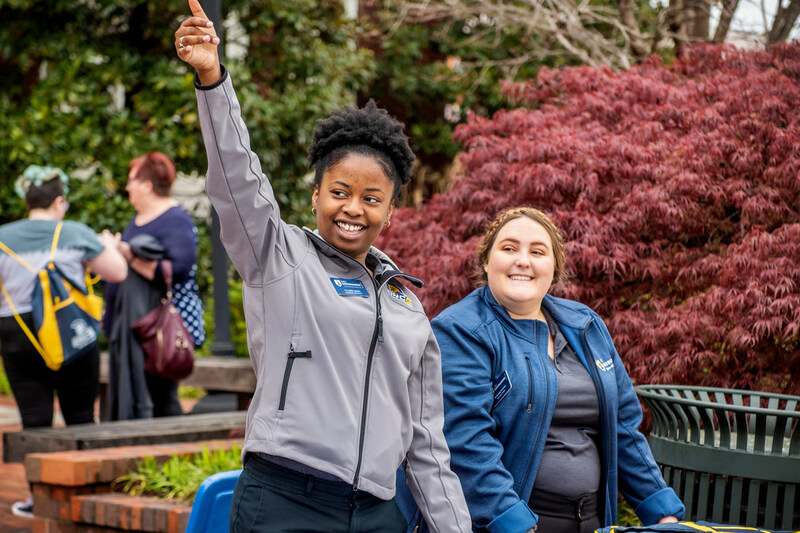 Claire King, an assistant director at the undergraduate admissions, and Maggie Leone, a Spartan Guide, welcome UNCG admitted students and their family members to the day’s opening Destination UNCG event. It will begin in UNCG Auditorium with an introduction from the Director and Senior Associate Director of the Undergraduate Admissions Office. 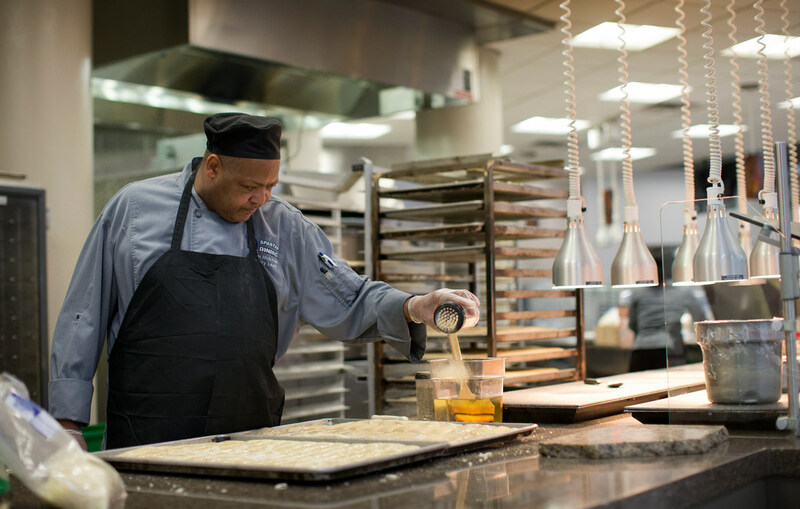 The day then follows a schedule of activities and information sessions held in academic buildings, the EUC, and other locations on campus. Photo: Jiyoung Park. 9:14 p.m. April 5. Cone Ballroom, EUC. What a finale! The UNCG Spartones end the inaugural AccapellaFest with “Valerie” by Amy Winehouse, arranged by Te’Quan Seabrooks. 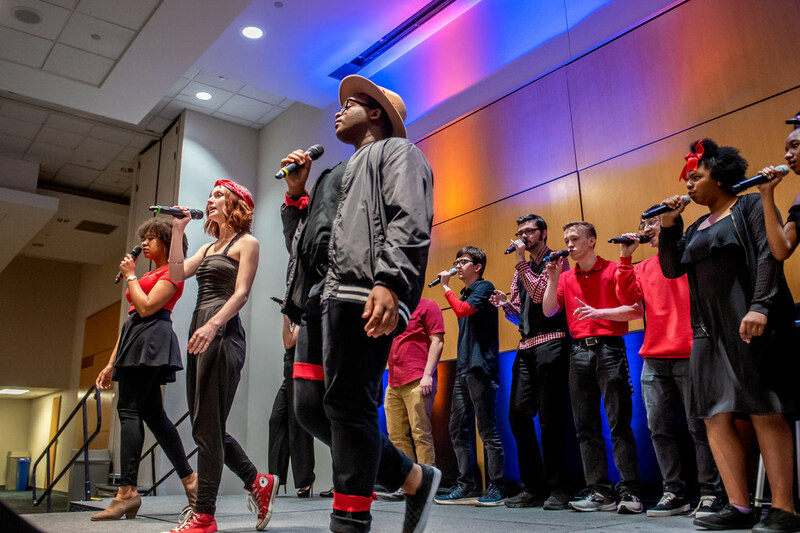 This is the inaugural AccapellaFest, featuring several acappella groups on campus. 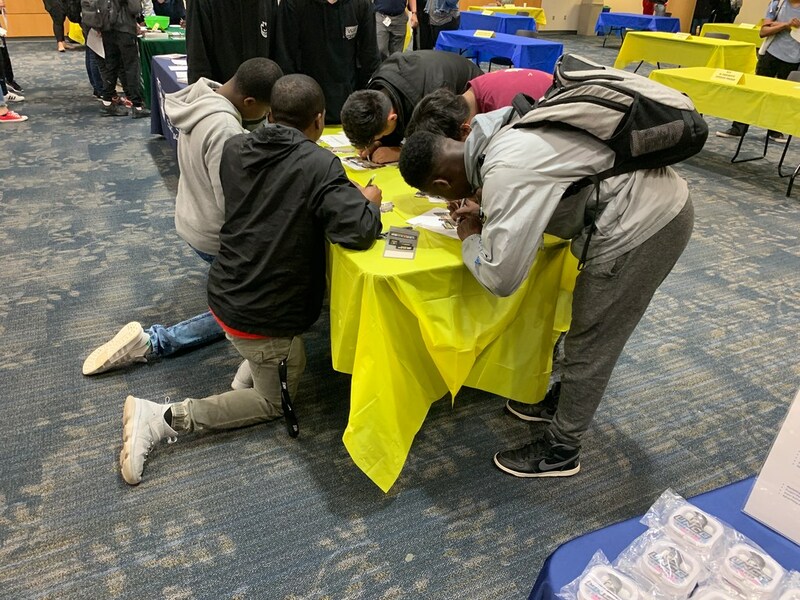 About 250 students enjoyed the big event. Photo: Jiyoung Park. 8:40 p.m. April 5. Cone Ballroom, EUC. 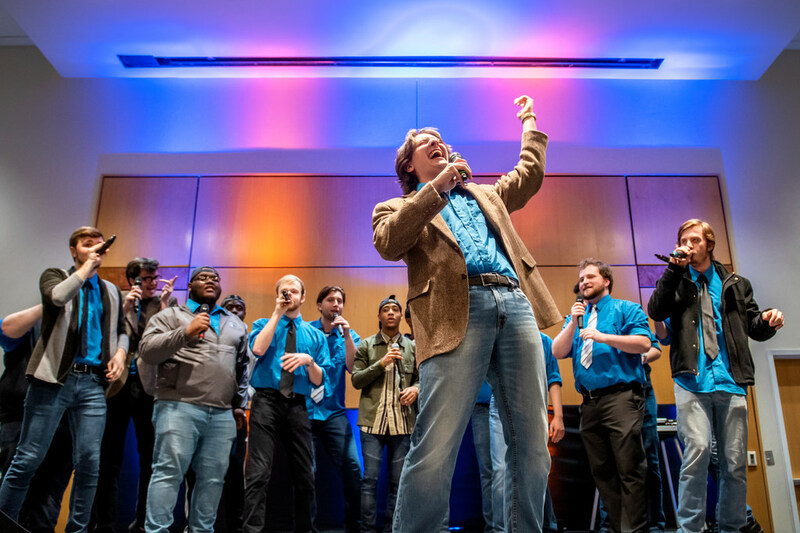 UNCG’s Note Control performs three songs at the inaugural UNCG acappella event AccapellaFest. It features several acappella groups on campus, such as UNCG Spartones, The UNCG Chariots, UNCG Seraphim, Note Control, and UNCG Sapphires. About 250 students are in the spirited audience. Photo: Jiyoung Park. 7:31 p.m. April 5. UNCG Pop Up Shop, South Elm Street. 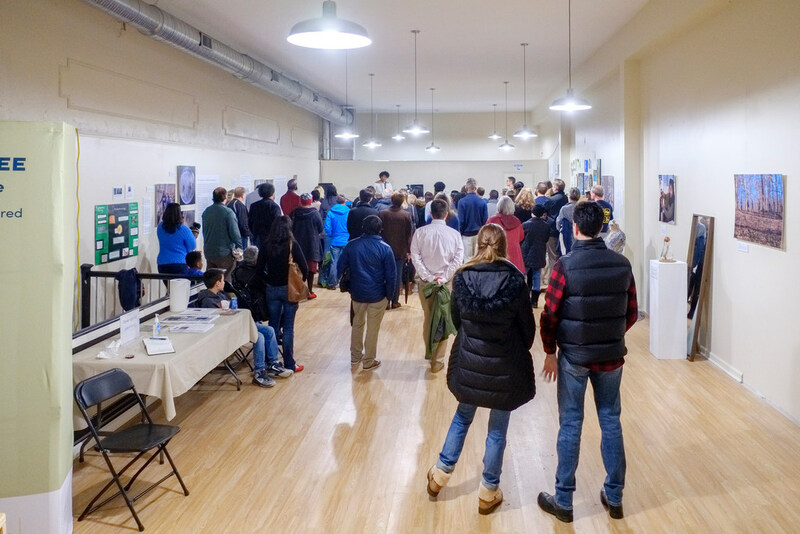 At Downtown Greensboro’s First Friday event, a reception features performances and readings about a powerful exhibition displayed on these walls. It is drizzling outside, and very welcoming inside. The exhibition, “The Underground Railroad Tree: Explorations through Art, History, and Science,” blurs traditional disciplinary boundaries of study conducted at UNCG within the context of two classes: an honors history and methodology seminar co-taught by Dr. Omar Ali and Dr. Nadja Cech, and an organic chemistry course taught by Dr. Kimberly Petersen. Photo: Martin W. Kane. 6:22 p.m. April 5. Elliott University Center. 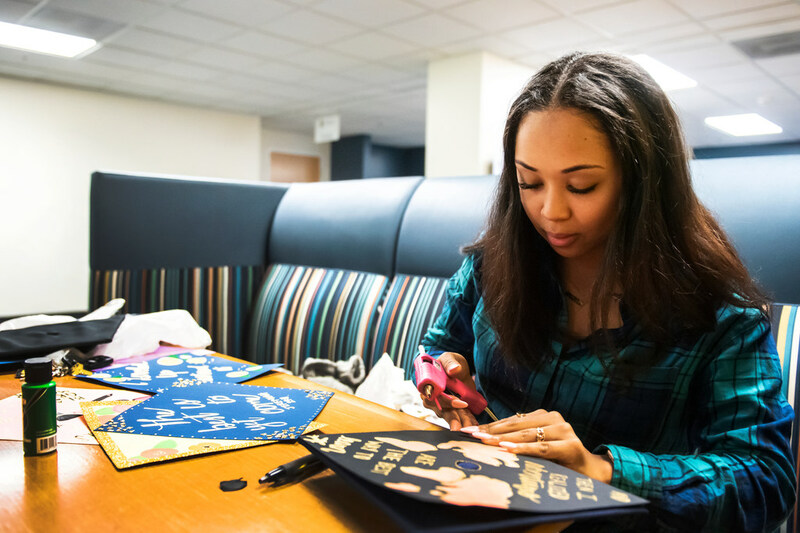 Siara Burwell, a 2017 graduate, is in high demand for decorating graduation caps for graduating UNCG students. Siara started decorating other students’ caps when she was a senior in UNCG. So far this semester, she has gotten about 30 requests. When she was a student, she co-founded Girl Talk UNCG, was a member of Alpha Kappa Psi, and majored in social work and minored in Spanish. Photo: Jiyoung Park. 6:17 p.m. April 5. Elliott University Center. The Science Fiction Fantasy Federation, a longstanding student club, knows how to have Friday fun. 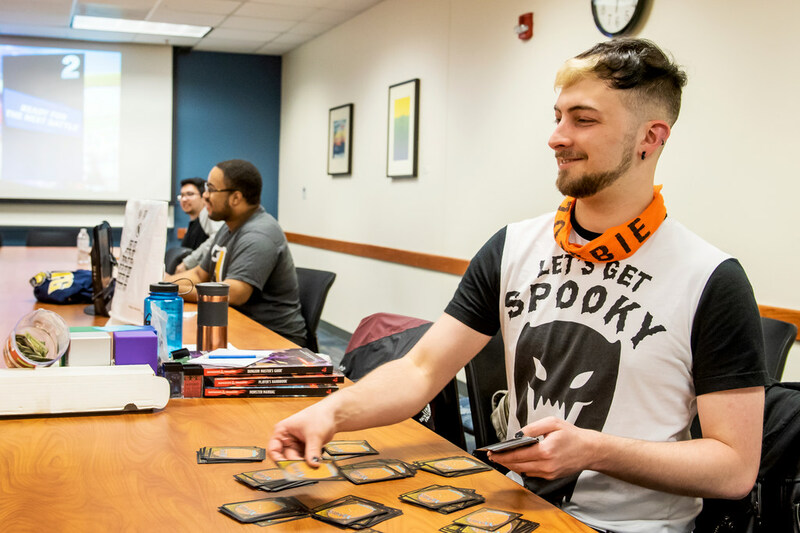 Here, Phillip Jones, a “super senior” computer science major and club president, distributes cards to play a ‘Magic The Gathering’ card game. Photo: Jiyoung Park. 6:09 p.m. April 5. Elliott University Center. UNCG’s Science Fiction Fantasy Federation – a 43 years old club – is the second oldest club at UNCG. It started as a Star Trek fan club, and it boldly has taken off from there. 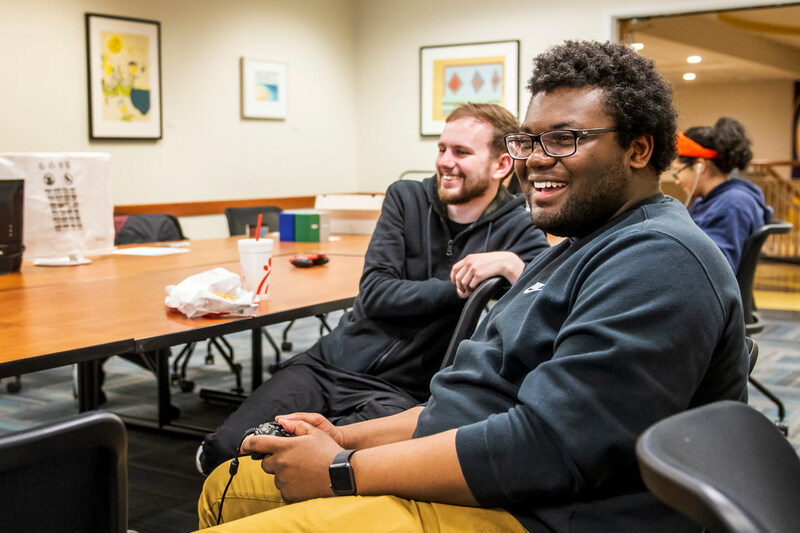 Phillip Garrett (right), a sophomore, is playing Super Smash Bros. with Ashae Carver (not in photo), a UNCG alumnus who comes to the Friday night meeting often. Garrett Mostella, a senior (left in background), is watching the game. Phillip is Villager and Ashae is Yoshi, in the video game. Photo: Jiyoung Park. 3:27 p.m. April 5. Walker Parking Deck. 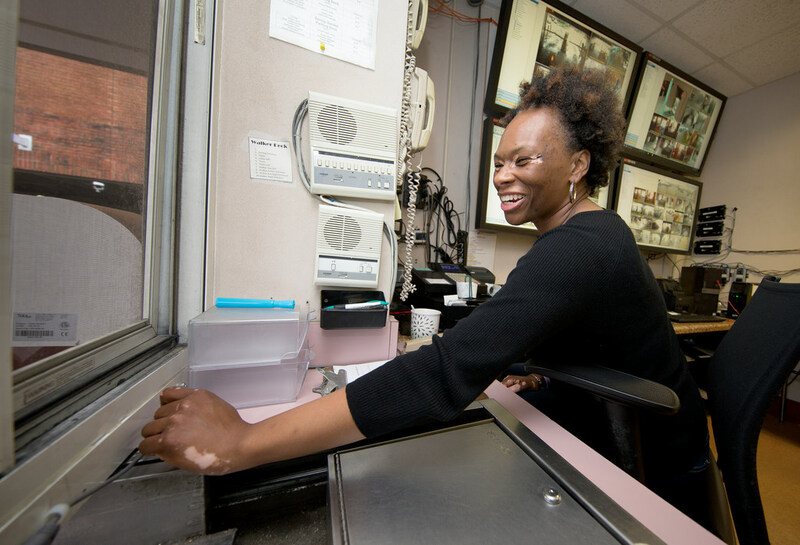 Tiffany Hunt, parking operations manager, works the cash register at Walker Deck. The deck’s capacity is 850 cars. On an average day approximately 3,000 cars will park in the deck at one time or another. Mounted on the wall are monitors for Oakland, McIver and Walker parking decks. Photo: Lynn Hey. 2:33 p.m. April 5. Elliott University Center. Joanna Goedeke (in green), Jon Godsey (left) and Celeste Block (far right) meet with Rob Seals, InterVarsity campus minister. They are discussing fall activities for the InterVarsity student organization. Photo: Lynn Hey. 1:54 p.m. April 5. Mossman Building. 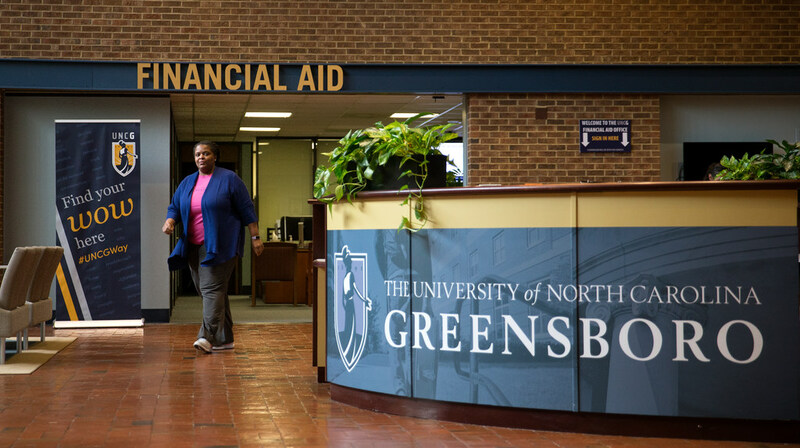 DeeDee Carter, senior financial aid counselor, works to make college more affordable for students, she said, by helping find scholarships and grants. She has served eight years in the Financial Aid office. Photo: Lynn Hey. 1:40 p.m. April 5. University Registrar’s Office. 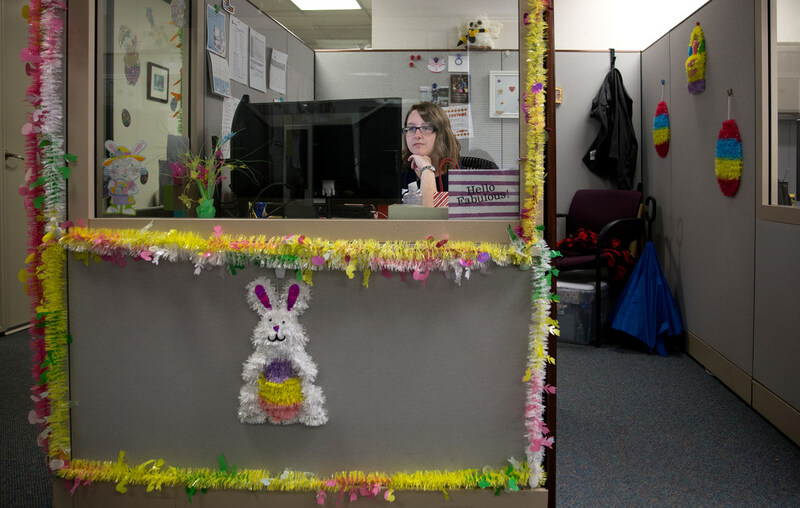 Registration Specialist Jillian Lincourt decorates her cubical in Mossman Administration Building almost every month. It’s ready for Easter and will be outfitted for commencement in May. Photo: Lynn Hey. 1:30 p.m. April 5. UNCG Pop Up Shop. 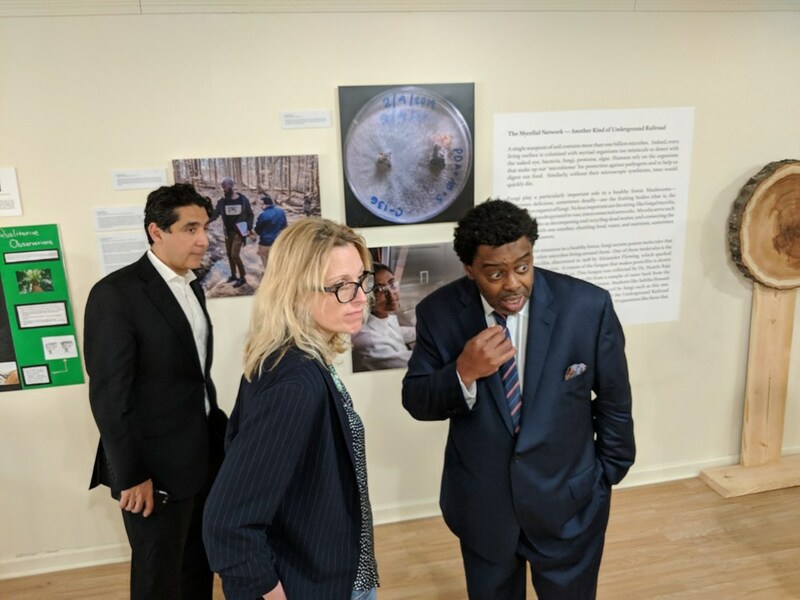 Dr. Omar Ali, Dr. Nadja Cech, and Chancellor Franklin D. Gilliam, Jr. explore “The Underground Railroad Tree: Explorations through Art, History, and Science” in downtown Greensboro. The exhibit features work by UNCG students, faculty, and staff, and will be displayed through April 7. Photo: Matthew Bryant. 12:33 p.m. April 5. Union Square. UNCG hosted screenings this weeks of a new documentary, “Unlikely,” about the challenges surrounding student success. 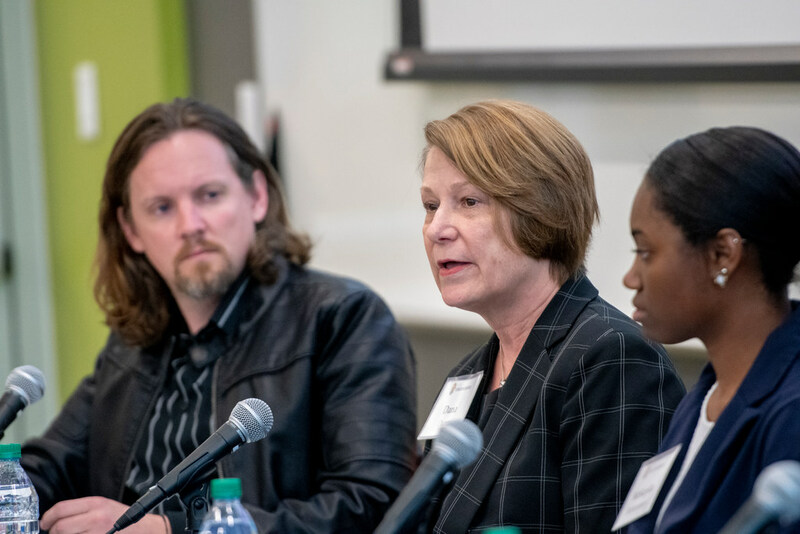 Today, filmmaker Adam Fendersen, Provost Dana Dunn, and McNair Scholar and psychology major McKayla Bohannon were among those in a panel discussion with faculty, staff, students, legislators, donors, sponsors, and trustees. Photo: Martin W. Kane. 12:11 p.m. April 5. Double Oaks Bed & Breakfast. 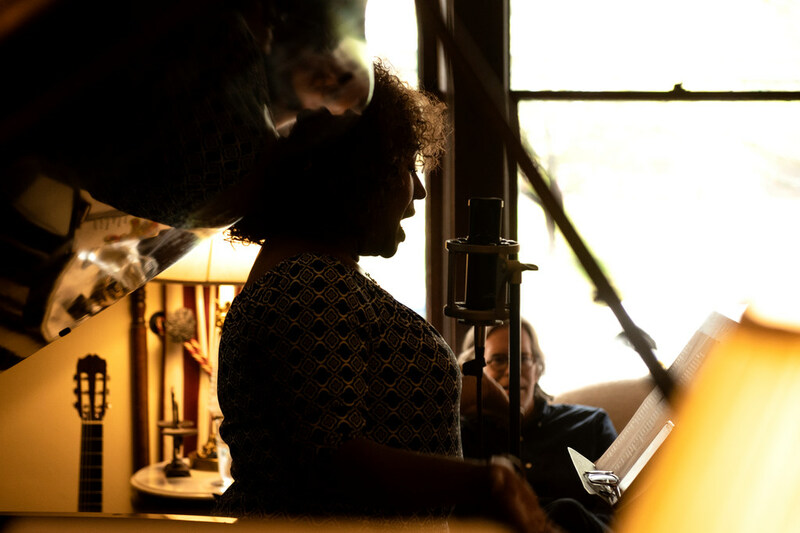 Women’s and Gender Studies Program Administrator Sheila Washington and Julian Kennedy, a freshman majoring in jazz studies (concentration in piano performance), perform during Music, Gender, and Protest in the 1960s: A Symposium with Concerts (Part 1 – The Sing Along). 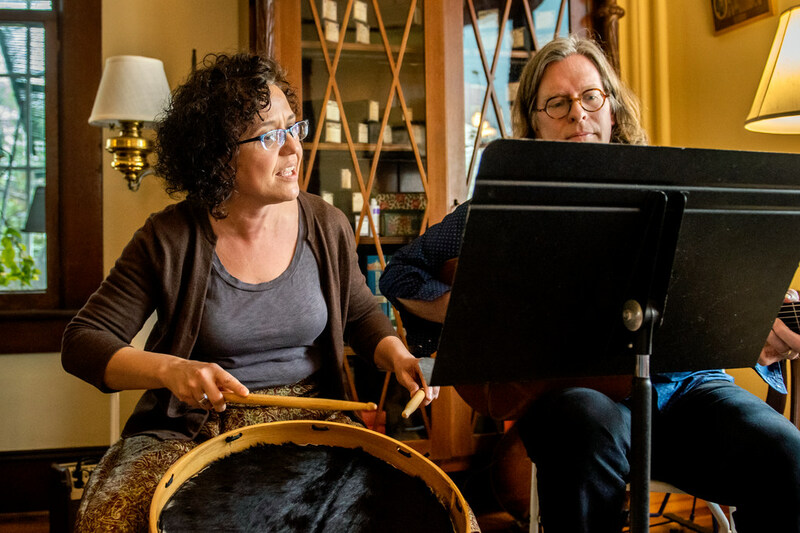 The concert is the first of three events highlighting music as a form of expression during the protest movements of the sixties. Photo: Jiyoung Park. 11:24 a.m. April 5. Foust Building. 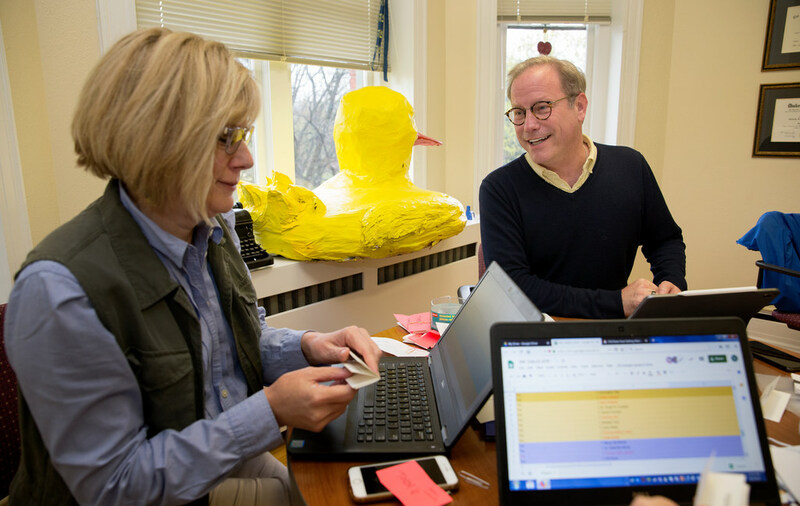 “Ducks make me happy,” says Ches Kennedy, major gift officer for the College of Arts & Sciences. It all started when traveling for work and having “one of those days.” Returning to his hotel, he found a rubber duck in the bathroom, placed there by staff. “It lightened my mood and made me happy,” Kennedy said. That started his collection. The large paper mâché duck in his second-story office window was left anonymously at his door. Here, Kennedy sits with Mary Swantek and Susan Lawing (out of frame), working on an upcoming scholarship awards luncheon. Photo: Lynn Hey. 11:17 a.m. April 5. Foust Building. 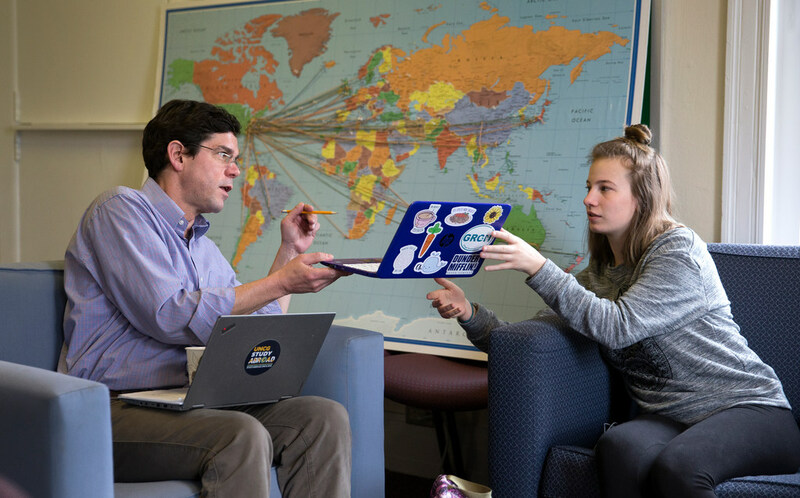 Tom Martinek, Jr., Director of Study Abroad and Exchange Programs, works with freshman education major Katie White, planning her academic program for study abroad in Finland in the fall of 2019. Photo: Lynn Hey. 9:49 a.m. April 5. Elliott University Center. 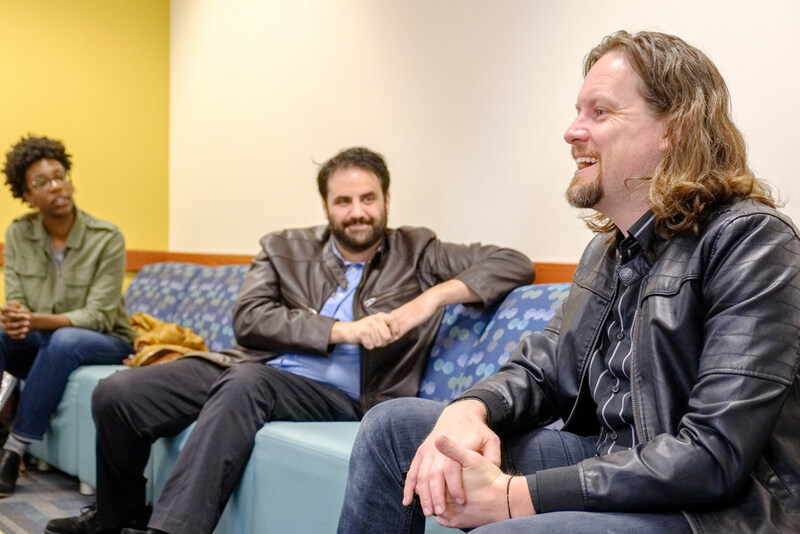 Filmmaker Adam Fendersen (right) discusses the production of his documentary “Unlikely” with Media Studies students. The documentary on student success was screened throughout the week. Photo: Martin W. Kane. 9:46 a.m. April 5. Gatewood Studio Arts Building. 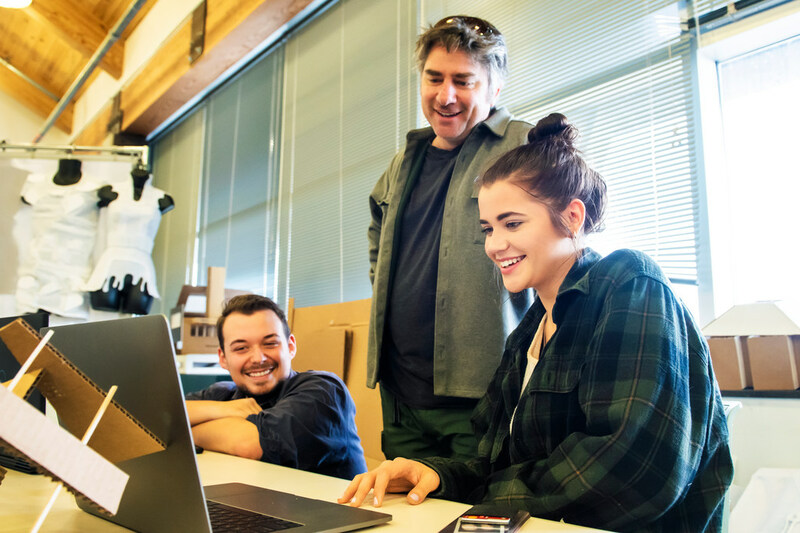 Assistant professor Stephen Skorski critiques second-year student Alyssa Wineman’s 3D digital model during his Interior Architecture class. Second-year student Jordan Hunsucker looks on. Photo: Jiyoung Park.